After the top 10 largest markets for Fiat-Chrysler (more market analysis are still to come), today I’m going to start with the Fiat 500 to make the analysis by model. I’ve been collecting data of all models sold by Fiat-Chrysler in all markets and I am glad to say that I’ve done a good job so far. Fiat-Chrysler sold 4,209 million units, according to ‘Q4 & FY 2012 Results Review’ presented by the group in late January 2013. From that amount, I’ve been able to collect information that counts for 4.011.032 units, which is 95% of total sales. That number is the total of all models sold by Fiat and Chrysler worldwide. Thanks to my research and some people who kindly helped me, I gathered information for 59 countries and 68 models. 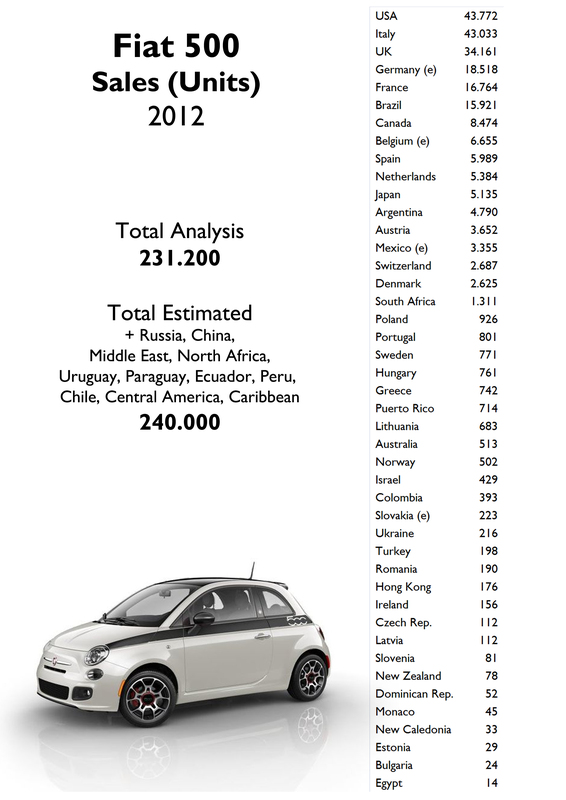 The first to be analyzed is going to be the most international one: the Fiat 500. The 500 was Fiat-Chrysler 3rd best-selling car in 2012. I could collect data that totaled 231.200 units, but I estimate that around 240.000 units were sold worldwide last year (counting China, Russia and some other countries). The car represents 5,7% of the group’s sales. As I only have information for 32 countries regarding 2011 results, the variation counts only for them: 18% more than previous year. 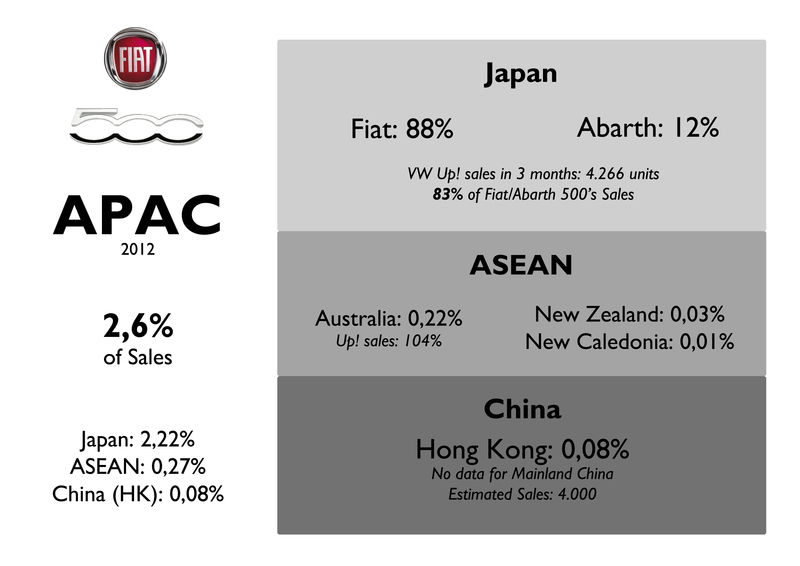 Source: http://www.bestsellingcarsblog.com, Data House, and Fiat dealers in some countries. This small Fiat demonstrates what this brand can do when it works properly. It is the car that proves that Fiat can go wherever it wants and be successful. The 500 is the example of how a car can become an icon and a referent everywhere it is introduced. Its success is even more impressive if its age is considered: it was introduced in 2007, but it still reigns as the best-selling stylish city-car. The story of success is well-known by everybody, but last year’s result show that Fiat can succeed even if it offers more expensive cars and they are 5 years old. The 500 is not the best-selling car of the group, but it could be considered the most successful one as it can maintain its sales registrations level and be present with interesting results, in several countries. The top 2 best-sellers of Fiat-Chrysler group, the Ram Pickup and Fiat Uno, are more popular but depend a lot of their home markets. The right mix of charming design, personality, right price and positioning, Fiat made what anyone would believe: to succeed selling a car that is more expensive than its rivals no matter the fact the car is 5 years old. In 2012 it completed its second step to become more global thanks to its success in US market. The next step should be to conquer China and India, not an easy job. For the 500, I collected data for 44 countries, so sales totaled 231.200 units in 2012. Of course the final result is even higher as some markets are missing (such as China and Russia). But that number shouldn’t change a lot as the 500 hasn’t still conquered those markets with high volumes. In 2012, Italy stopped being the largest single market for this model. 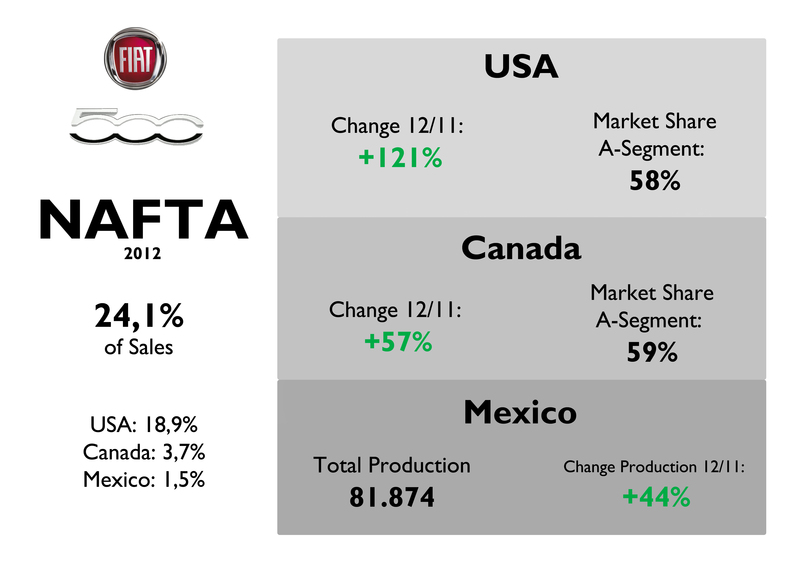 For the first time in history USA dethroned Italy as the largest market for a small Italian Fiat. 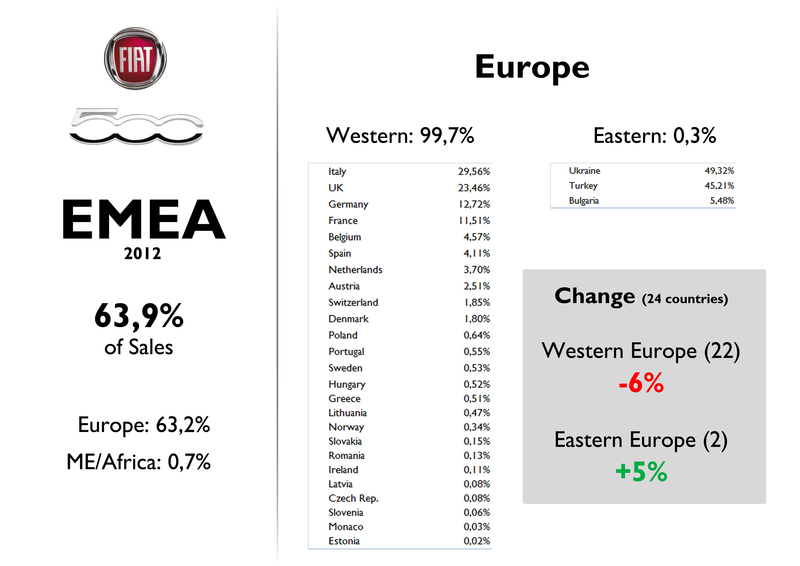 This was possible because of two opposite situations: sales registrations jumped in USA while they dropped in Italy. The final result is USA ahead only by 739 units. Of course, in terms of market share, Italy continues to be the best market for the 500, but takes more relevance when taking into account that Fiat brand in USA is only available since 2011, after years of bad image and low awareness. The good thing is that sales are not highly concentrated in these 2 markets. The 500 is also very popular in the UK, France, Germany, and some how in Brazil, Argentina and Japan. In terms of share, the 500 was the best-selling city-car in USA, Canada, UK, Belgium, Spain, Austria, Hungary, Lithuania and Monaco. It occupied second place in Italy, France and Switzerland. From the 32 countries I could collect information to evaluate the change year-on-year, the 500 registrations increased in 19 of them. The falls took place in European countries and Turkey. The 500 is built in Poland and Mexico, but the car is not really popular in those markets. 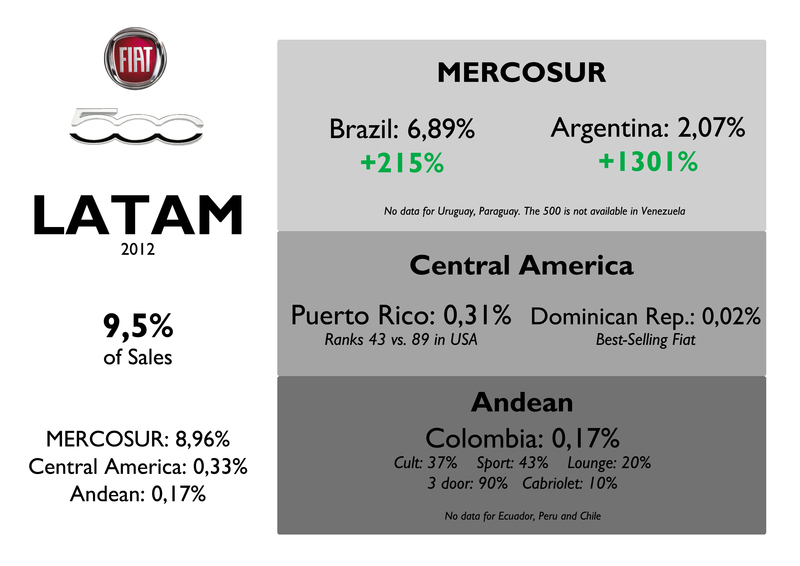 Europe counted for 63% of Fiat 500’s sales, followed by North America and South America. Two out three 500 sold were made in Poland, as the Polish version is for sale not only in Europe but in the Middle East/Africa, Japan and Australia. The Mexican one is exported in all the Americas and China. The 500 felt the crisis but not as a 5-year-old nameplate should. Its sales plunged in Italy, but did quite well in the UK, Belgium, Spain and Germany. This mini car could resist the crisis and the arrival of more competition. It shined in France beating some locals, while in Germany it made to rise its registrations just where the Up! began to rule. However, this popular Fiat had some problems in minor markets (plus Italy) which demonstrates that a new generation should arrive soon. Click here for the full analysis of Fiat 500 vs. Panda vs. VW Up! sales in Europe 2012. While the 500 begins its decline period in Europe, it just had the expansion period in the Americas. 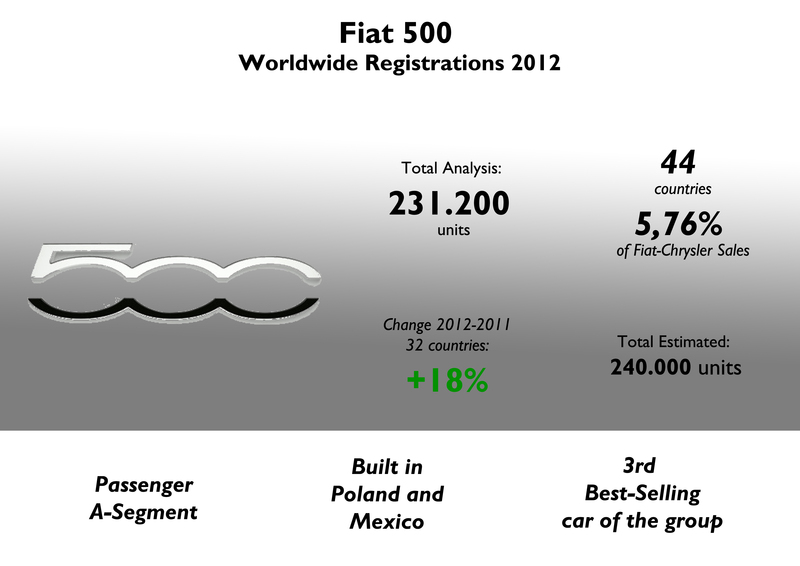 2012 was the first full year of sales of the 500 in USA, Canada, Mexico, Brazil, Argentina and other American markets. After a slowly start, the 500 took off in 2012 allowing the Mexican factory to work full-time. Records in every country as the car was finally offered at a lower price. This was possible because Mexico has free trade agreements with almost all American countries. 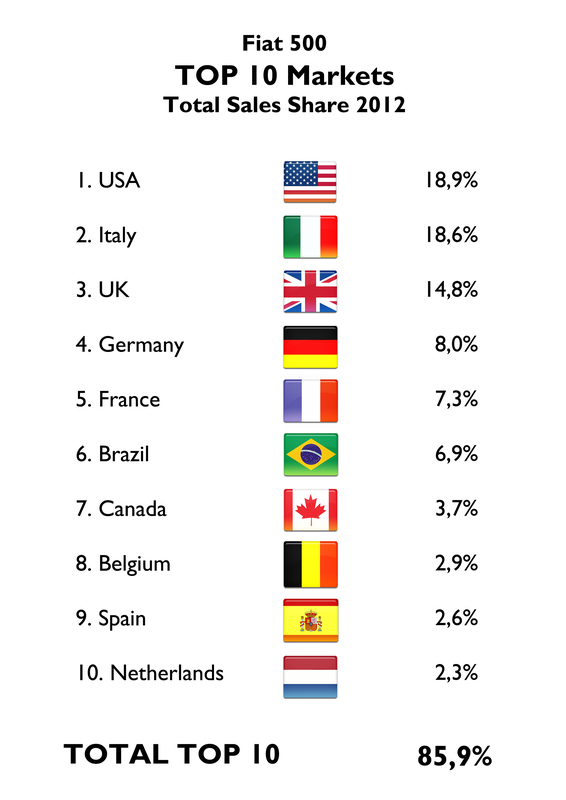 Notice that Brazil and Canada became Fiat 500’s sixth and seventh largest markets, ahead of Belgium, Spain and the Netherlands. A very good start. The 500 is quite unknown in the whole area. It only reaches interesting results in Japan and Australia, but in both markets it suffered the consequences of the arrival of VW Up!. The car was recently introduced in Korea, while it was presented last year in China, but without any spectacular results as it is imported from Mexico. This city-car is not available in the land of mini cars, India. The 500 may had already reached its top sales volume. In America its sales are expected to stabilize this year, while it is expected a tiny fall in South America due to import regulations. 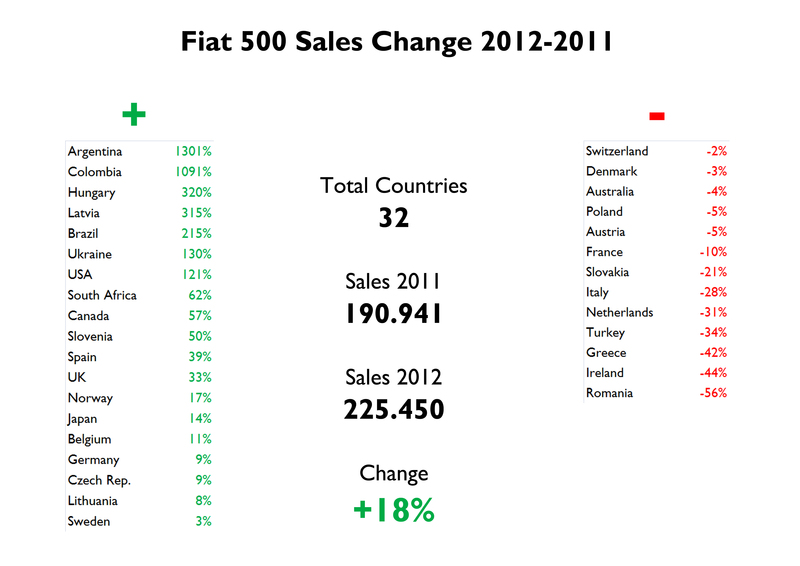 In Europe, as total sales will be flat this year, the 500 is not expected to jump. However it will keep its share waiting for a successor that should arrive in 2016. Meanwhile this important nameplate should conquer China’s lower premium segments only if Fiat decides to produce it locally (which I doubt). Regarding other markets, the 500 could also succeed only if it is properly adapted. Just as I wrote some months ago, the 500 could have a brilliant future in Japan, if the FTA that will sign EU and Japan takes place, and Japan facilitates imports (besides, the 500 should be shortened to fulfill kei-cars regulations). In India the car could also succeed only if it is adapted for local consumption and produced locally. Recently Fiat said that the future generation will be exclusively produced in Poland for the whole world, so Polish factory can recover its production levels. But, is it wise from the point of view of markets access? Poland may be good for European markets, but Mexico is much more important for having access to North and South America, and soon to Japan and China. These numbers are calculated on 4.011.032 units I collected so far. 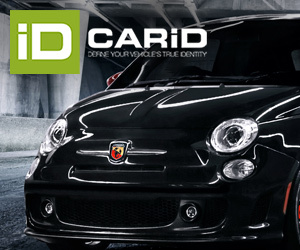 The 500 is certainly a key product for Fiat brand and the whole group. Thanks to Manuela Todeschini from Colitalia Autos Colombia, Róbert Gábor from Data House, Domenico Di Cintio from AutoItalian, Robert Breton from Fiat Dominican Republic. While Brazil and Mexico do have a free-trade agreement, Brazil has imposed quotas on imports from Mexico, so imports of the 500 from Mexico will be limited. Yes sir, that’s right. This year won’t be easy for the 500 in Brazil. Or for its competitors … Brazil has really made the FTA meaningless. They know that Mexico is their biggest competitor.